Have you ever had a meal so tasty you wanted to grab the chef by the lapels and demand to know how they could concoct something so darn delish'? Well, Urban Listers, you're about to get that opportunity. As part of this year's James Street Food and Wine Trail, all of your favourite James Street chefs, bakers, and food personalities, including Gerard's Bistro's Ben Williamson, Bucci's Shaun Malone, and Harveys' PJ McMillan, will be cooking it up in a series of live interactive, demonstrations at the ILVE tent. So, while they're busy seasoning, you can pepper them with questions (see what we did there?). It's a foodie dream come true! This full day of divine cooking demos (taking place on the Food Trail's Feast Saturday, on the 3rd of August) features a stellar line up of food personalities sharing the tricks, techniques, and tasty-secrets behind your favourite dishes. The day kicks off with Danielle Dixon, the mastermind behind the Italian pastries at James Street newbie, Pronto Bucci, with super-stars from Jocelyn's Provisions, John Meredith from the James Street Cooking School, and Rhett Willis from Standard Market Co rounding out the program. The cooking demonstration will take place outside Harveys Bistro, in a relaxed marquee setting with a fully functional kitchen (complete with schmick ILVE appliances). Editor of Feast, and culinary extraordinaire, Alix Clark, will be on hand all day as official MC to offer her own cooking knowledge to the crowd. To celebrate this exciting opportunity to pick these world-class chefs' brains, they have generously offered up a tasting teaser to the day. We have a series of lip-smacking, formerly top-secret, recipes, from some of the world-class chefs who'll be presenting on the day. Pronto Bucci | What could possibly be better than donuts? That would be Zeppole Italian donuts with apple and zested orange, courtesy of Italian pastry chef, Danielle Dixon. Danielle recommends these puffy, golden balls of donut-bliss be served with dark chocolate, and orange and brandy compote, or a shot of espresso. And we cannot wait to try out her suggestion. Bucci | Pulled pork may be hot right now, but perfect pulled pork is timeless. Bucci's, Shaun Malone has the tricks for a perfectly cooked roast pork, so melt-in-your-mouth delicious you can shred it with a fork. You know you want to make this. Gerard's Bistro | Here at The Urban List we would like to chain Gerard's Ben Williamson to our kitchen bench and have him cook for us forever. While this fantasy might be unobtainable (and a bit illegal), we have the next best thing. Ben shares his recipe for Flathead with potato mousse, scallop, and spiced seaweed crumble. Harveys | PJ McMillan is a well-known face around James Street, and his fantastic fare is even more famous still. And now, lucky us, he's generously sharing some of that Harveys magic with the world. His sublime recipe for roasted beetroot with baked ricotta and hazelnut dukkah is a delicious example of PJ's simple yet stunning food. Jocelyn's Provisions | We are more than a little bit excited about this one. 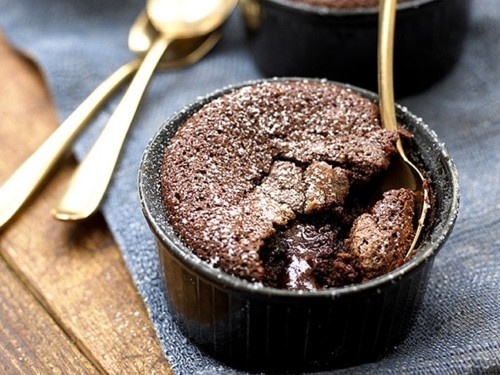 Jocelyn's Provisions are renowned for their sweet treats, and now you can bake with the best of them, because we have their recipe for gooey, molten chocolate puddings, with orange and mint salad! Yum. For the full program of the day's events, click here. TUL Note: Today's List Love post is proudly sponsored by James Street Initiative and endorsed by The Urban List. Our sponsored posts will never be a secret - the List Love seal will be stamped on any sponsored material you see on the site. Thank you for supporting the sponsors who make The Urban List possible.